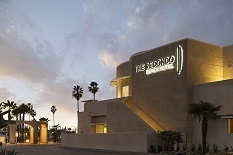 The Redondo Beach Hotel is located near King Harbor and offers views of the Marina. The hotel features over 112 guest rooms and suites as well as a complimentary breakfast, meeting spaces, an outdoor heated pool and bike rentals. Ocean facing rooms have spacious balconies and a second level outdoor lounge offers spectacular marina and ocean views. The hotel is newly opened and will definitely be a popular place to stay for our visitors.